For the 24th season of our Chautauqua living history series, Seeking Justice, we are commemorating three Americans with a commitment to justice. Chautauqua continues this week through July 15. 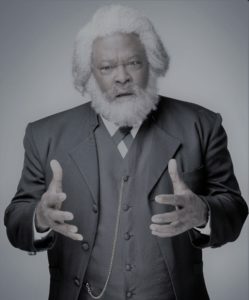 Communications Specialist Sarah Weissman interviewed and wrote a feature on Bill Grimmette, the Chautauqua actor-scholar who portrays Frederick Douglass. This year is the Frederick Douglass Bicentennial, the great man having been born 200 years ago on Valentine’s Day. Grimmette portrays the famous abolitionist at Chautauqua 2018: Seeking Justice. “The impact of that experience on all concerned must have been deeply very profound,” he says. The anecdote is only one of multiple stories about Douglass mostly unknown to the general public. “I learned so many new and surprising things that it was difficult [to] ponder why we never knew them.” There are also missing pieces of Douglass’ legacy that not even Grimmette could discover in his research. In his different presentations as Douglass, Grimmette uses the theme to focus his research and performance. He explains the aspect of Douglass’ life that most interests him regarding Seeking Justice. “His efforts to run away from slavery, to read, to teach, and to work taught him how to earn respect first and from there, how to leverage it for justice,” Grimmette says. When deciding on the content of the performances, Grimmette’s biggest challenge is deciding what information to exclude. “One wants to tell every delicious morsel of the many tales spun by, for, and about Frederick Douglass,” he says. Sarah Weissman is the Communications Specialist for Maryland Humanities. She previously served as the Communications and Fundraising Assistant at Woodbourne Center and the Marketing and Communications Director at Glass Mind Theatre, an all-volunteer company. Weissman has a B.A. in English from Goucher College, with a Concentration in Writing, as well as a Minor in Communication and Media Studies.